Pastor Scott Ryan (left) congratulates Doug Priestner (right) on the success of Meshoppen UMC’s Operation Christmas Child drive, which netted 150 gift boxes for children in need, as Doug’s mother, Dulcie looks on. 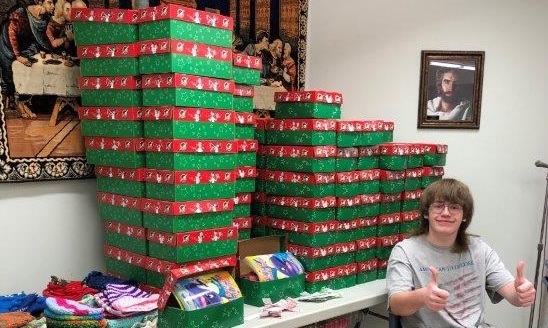 Doug Priestner, an Elk High School sophomore and member of Scout Troop 8 of Wyalusing, has been helping parishioners at the Meshoppen United Methodist Church with their annual Samaritan’s Purse project since he was old enough to put items in a box. Participation in the mission effort had waned in recent years, and Doug wanted to ensure its continuation. Samaritan’s Purse is a non-denominational evangelical Christian International Relief organization, based on the Biblical story of the Good Samaritan. The endeavor started in 1970 and has resulted in lovingly-packed goodwill boxes being shipped to those in need around the world and in the United States, especially those effected by natural disasters. 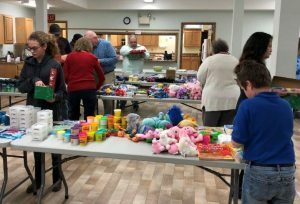 Doug, the son of Dave and Dulcie Priestner, approached the church’s Outreach Committee and shared his intent to manage the Operation Christmas Child drive this year. 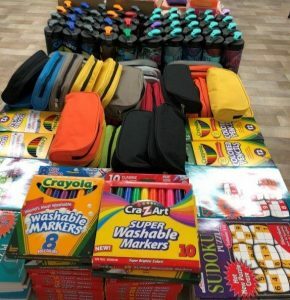 He provided church members with a list of items that he wanted to include in the boxes; a mix of hygiene and school supplies, small toys and bottled water. He maintained inventory and apprised parishioners, some of whom also made monetary donations, of his progress and what was still needed. It was important to him that the boxes be full, Dulcie noted. Doug set the dates for packing boxes and arranged the tables for the assembly-line process. 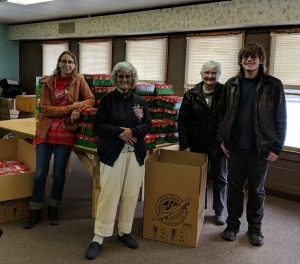 Over the course of several days and nights, participants, including Scouts and church members from Meshoppen and Lemon Township, filled and wrapped dozens of boxes. On Nov. 18, Doug’s helpers also enjoyed a covered dish dinner. Rep. Karen Boback was at the church for a meeting one evening and stopped in to learn about Doug’s project. 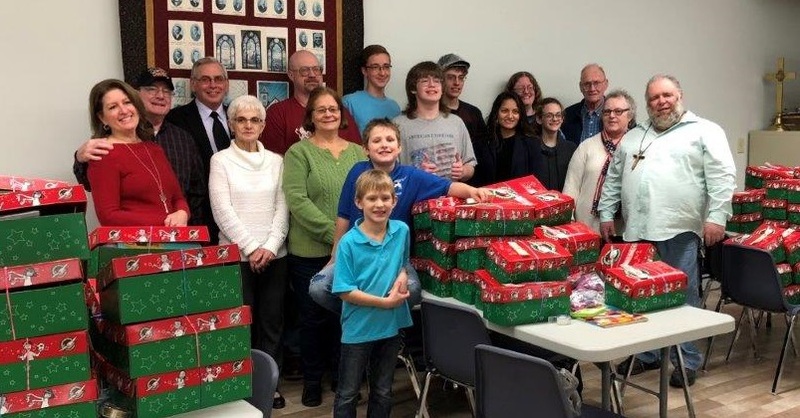 “With the help of my extremely generous congregation and members of the community, we were able to pack 150 very full shoe boxes for children in need that may otherwise not receive a gift for Christmas,” Doug related. The wrapped packages were taken to the Mehoopany Baptist Church, the local agent for Samaritan’s Purse, then trucked to a sorting center in Maryland. But Doug isn’t done yet. He and mom, Dulcie, will travel to Maryland on Nov. 30 and Dec. 1 where he will volunteer in two shifts of sorting. “I learned a lot by running this project and appreciate the opportunity,” Doug shared with parishioners via a letter in their church program. “My mom and I are really looking forward to joining our cousins and some other members of the Echo Lake Baptist Church of New Jersey in Maryland next weekend.” Doug indicated that Samaritan’s Purse will likely ship more than nine million boxes abroad this year. Doug’s older brother, James, rebuilt the exterior stairs at the Meshoppen UMC this summer for his Eagle Project through Troop 8. 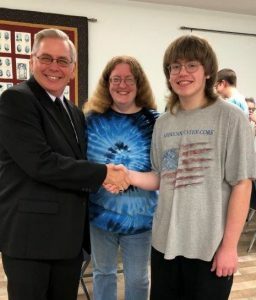 Both boys’ projects are pending approval from the Five Rivers Council, and their parents are hoping that they may celebrate their achievements in a combined ceremony. Mehoopany Baptist church members (from left) Beth Herwig, Ann Weeks, and Carole Borgeson receive Doug Priestner and his 150 gift boxes for distribution by Samaritan’s Purse. Doug Priestner is a happy Scout, having completed the collection and packaging of gift boxes for children as part of his Eagle Scout project.